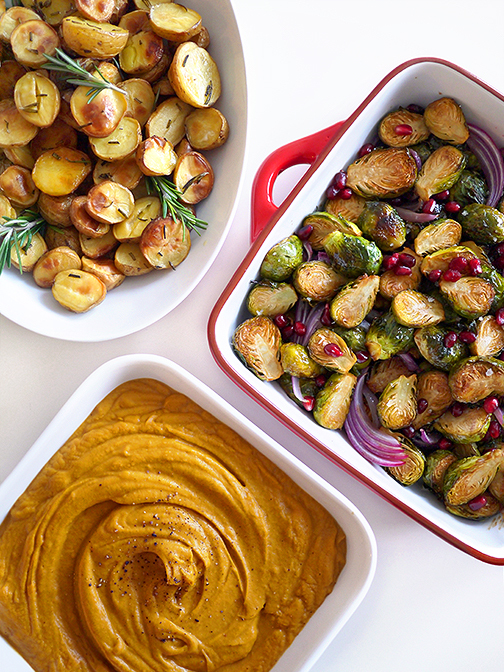 All 3 of these easy holiday side dishes are plant-based and super healthy, so you can feel good about eating them all year long, while sticking to any resolutions you may have made. And you can always pin these recipes to make next Christmas! Keep reading for step-by-step photos and recipes for each! 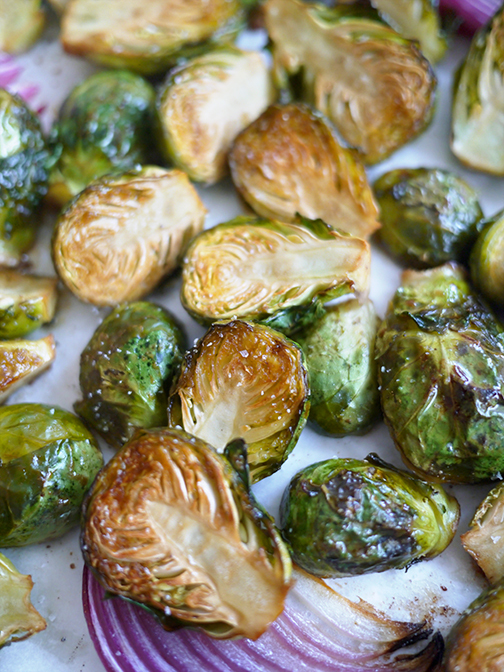 Start by washing and cleaning your sprouts, removing any less than perfect outer leaves and trimming the bases as necessary. 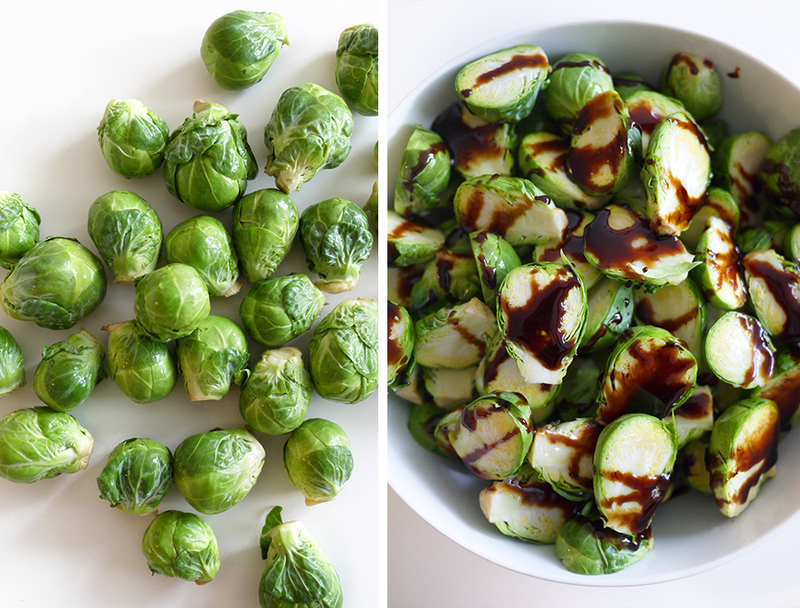 Halve them and add them to a bowl, drizzling them with pomegranate molasses (you can use maple syrup instead if you prefer), olive oil, and a pinch of sea salt. 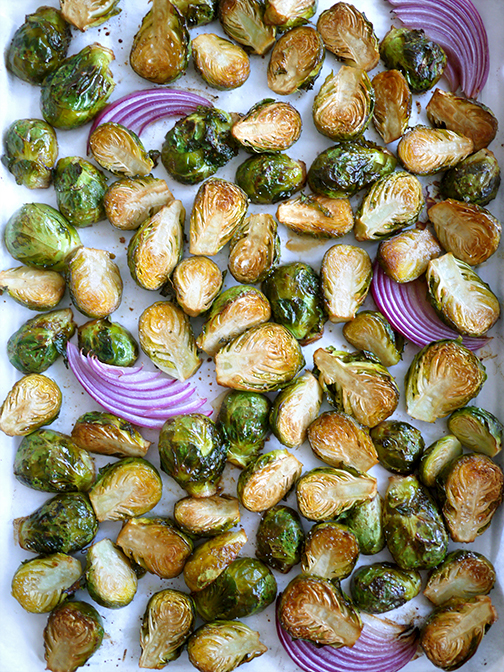 Hand toss your Brussels sprouts to make sure they’re all nicely coated, then lay them out flat on a baking sheet lined with parchment paper. Roast them at 400 degrees F (or 205 degrees C) for about 30 minutes, checking on them to make sure they’re getting nicely golden but not burnt. Keep them in a little longer if you prefer them crispier. I added wedges of red onion, because roasted red onion is delicious, and it adds another beautiful colour and dimension of flavour to the dish. Once they’re cooked to a beautiful colour, I like to brush them with a little bit of Earth Balance, to add that delicious buttery flavour and replace some of the moisture lost in the roasting process, then add a pinch more sea salt. 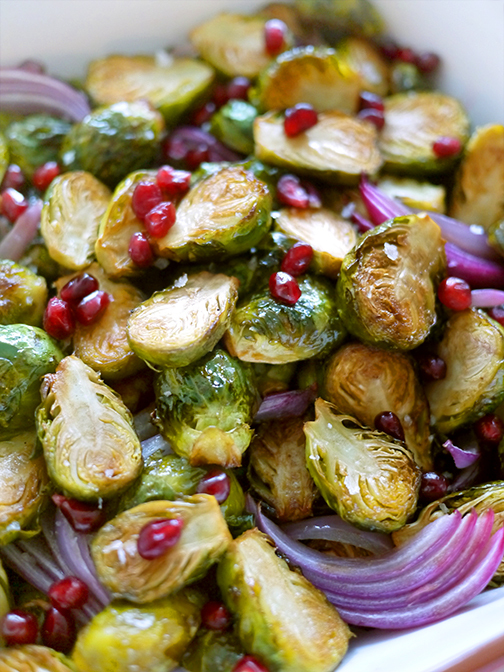 Transfer your Brussels sprouts and onion to a serving dish and sprinkle with fresh pomegranate arils. 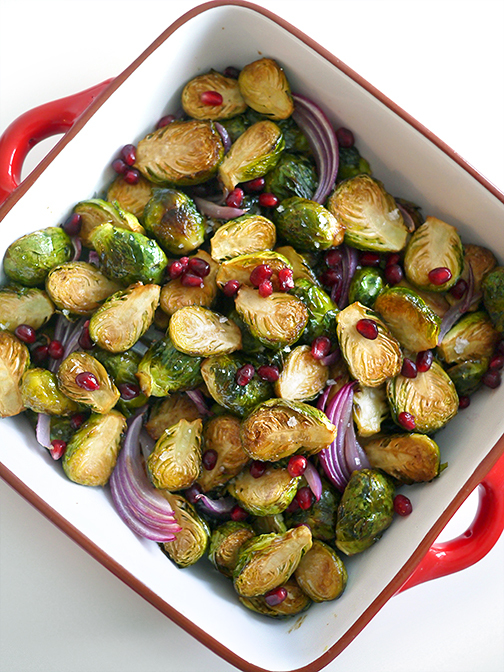 They add a beautiful burst of sweetness, a little acidity, and their jewel-like appearance make for a gorgeous dish that dresses up any holiday table, vegan or otherwise. This recipe is dead easy. You can roast an assortment of potato colours and types, but I just used white-skinned potatoes. 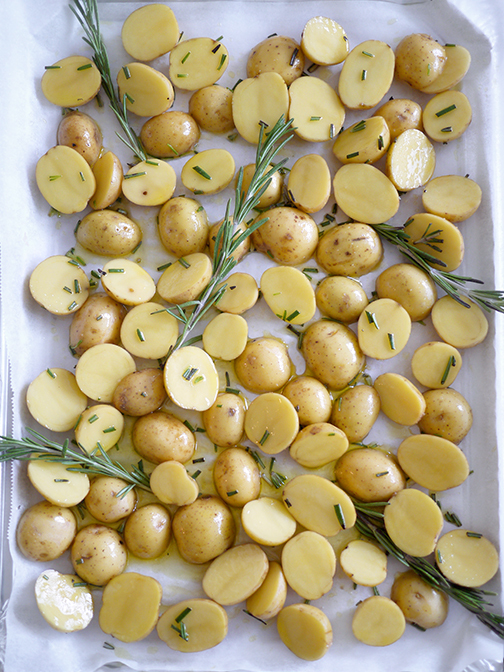 Wash and halve them, placing them on a parchment-lined baking sheet. 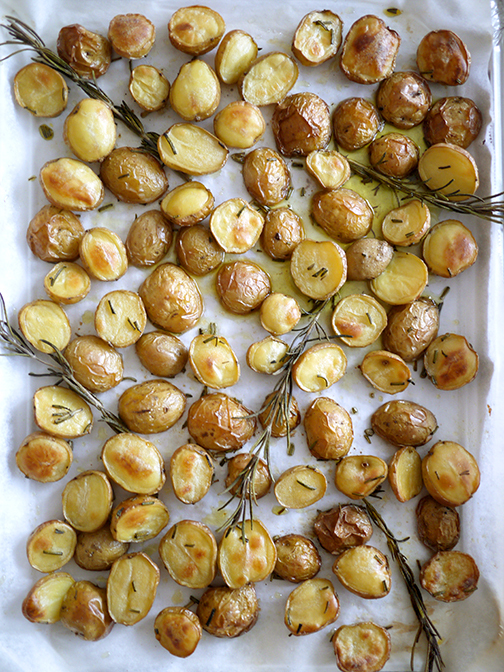 Drizzle them with olive oil, sea salt, and fresh rosemary that you’ve chopped finely. I prefer to use fresh rosemary because I find that dried rosemary just stabs you in the gums, which is neither fun nor festive. Pop those babies in the oven, roasting them at 430 degrees F for about an hour. If your oven is better than mine, you might only need 45 minutes. 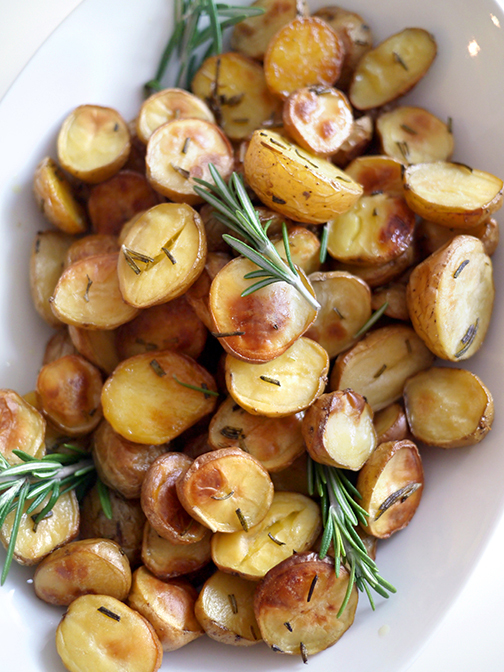 Pull them out when they’re beautifully golden-brown and a fork can glide through them. It was at this exact moment that I beamed with pride at my potatoes, because I hadn’t burnt them to a crisp. Go, me. And hopefully, go you!!! 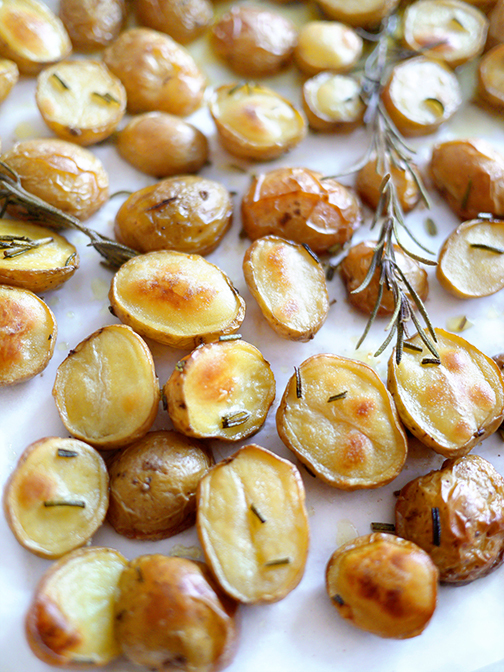 Add them to a serving dish, and garnish with a few springs of fresh rosemary. And now for the third dish: more potatoes! Don’t come for me, this is a potato-positive space. When I cook, I don’t really measure ingredients. I just add the amount that feels right, taste it, and adjust if necessary. So aside from the sweet potatoes, I’m guesstimating the amounts of everything. Chop up your 3 sweet potatoes into big chunks and add them to a large pot of boiling water, with salt. (About a tablespoon of salt? This part isn’t crucial.) Boil until fork-soft, then strain. I don’t have a hand blender, but I do have a Vita Mix, so I used that to blend it all up. 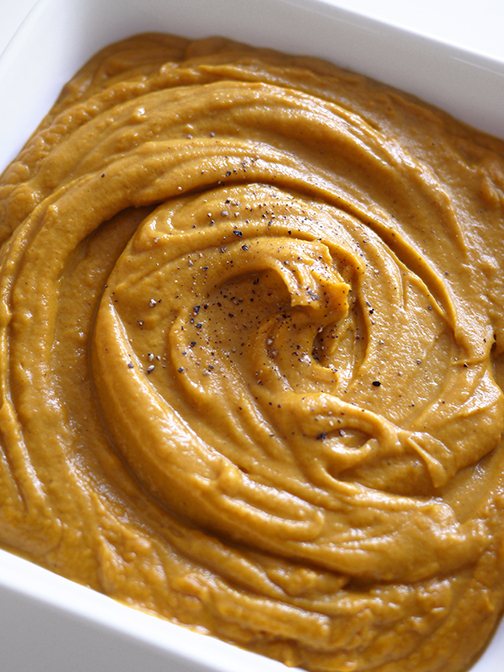 You can hand mash the sweet potatoes, use an immersion blender, or do whatever you prefer/have available. Add about 4 heaping tablespoons of softened Earth Balance to the mash (leave it out of the fridge while you’re prepping the ingredients), a teaspoon of salt, a tablespoon of finely minced ginger, a teaspoon of minced garlic, and a teaspoon of brown sugar (or maple syrup). 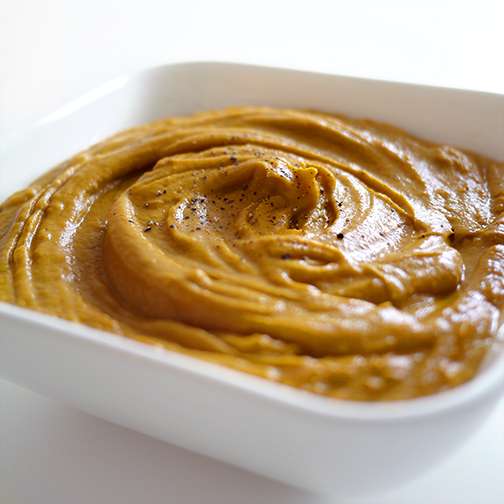 Blend or mash that up again, adding about a teaspoon of cinnamon and a dash of nutmeg. Try it and add more if you prefer. Serve and enjoy! You can whip up these easy vegan holiday side dishes for Christmas, Thanksgiving, or any chilly winter’s night. Bon appetit!